Other than koi and goldfish, there are different varieties of cold water pet fish which you can consider if you live in colder climate countries and you obviously want to avoid the hassles of maintaining a water heater. Just like any other tropical fish species, coldwater varieties are also interesting to keep and they make perfect pets even for newbies to aquarium fish hobby. Weather Loach is a fine example for a species which can tolerate low temperatures up to 20 degree Celsius. Depending on the breed, some weather loach can be quite hardy and will withstand extreme low oxygen water condition. It is an omnivorous fish which will accept different food types and it is generally a peaceful community species for home aquarium. This type of coldwater fish can grow up to very large size often reaching about 10 inches in length and thus the owner has to ensure that at least a 100 gallon fish tank is available. The picture above shows the overall appearance of a typical weather loach species and as you can see, its body is elongated in shape. 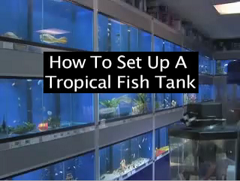 Setting up the tank to house your favorite cold water pet should not be a problem as long as you do not keep the tank bottom barren as weather loach has the tendency to burrow. Make sure that the gravel which you use as a substrate does not have sharp edges or else your fish will end up getting injured. Other than gravel, you can also use large rocks as decorative items and I would suggest putting in come freshwater aquatic plants as well to create the natural living environment. Some people would also go to certain extent to provide bog wood and cave cover as well, so this should be the perfect setup for your pets to hide in. Breeding the weather loach fish can be rather difficult because even if you maintain the perfect water condition and feed them well, chances that they will spawn are very less. There are tips shared by fellow weather loach hobbyist that suggest to lower the water temperature (up to 15 degree Celsius) and maintain it for about a week before slowing raising it back again. However, I find doing that to stimulate spawning can be rather time consuming and I would rather leave them breed on their own accord. Needless to say, having them around is more than enough to keep you occupied all day as you watch them feed and grow.